The above designs were for five new build homes in Worcestershire, UK. The modern homes have been carefully designed to meet high sustainability criteria and are aiming to achieve Code for Sustainable Homes level 4 or higher. The project gained planning approval before christmas 2014 and we are now working on making it happen! 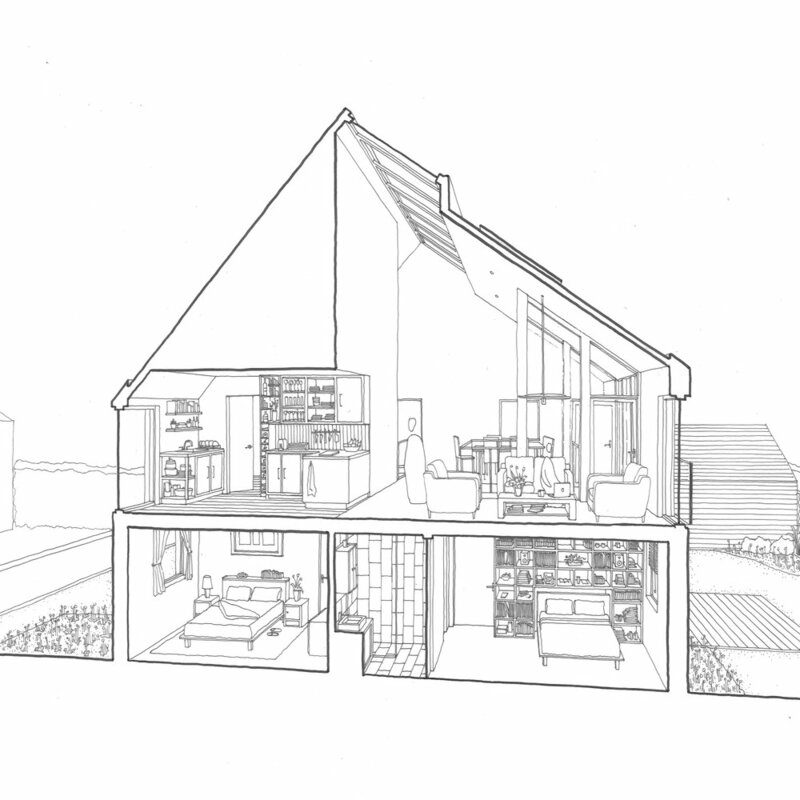 The plans for both the detached and terraced homes have been generated through careful Zoning. Layouts are oriented north/south, maximising the south façade in order to optimise solar radiation gains and daylight into the centre of the home. 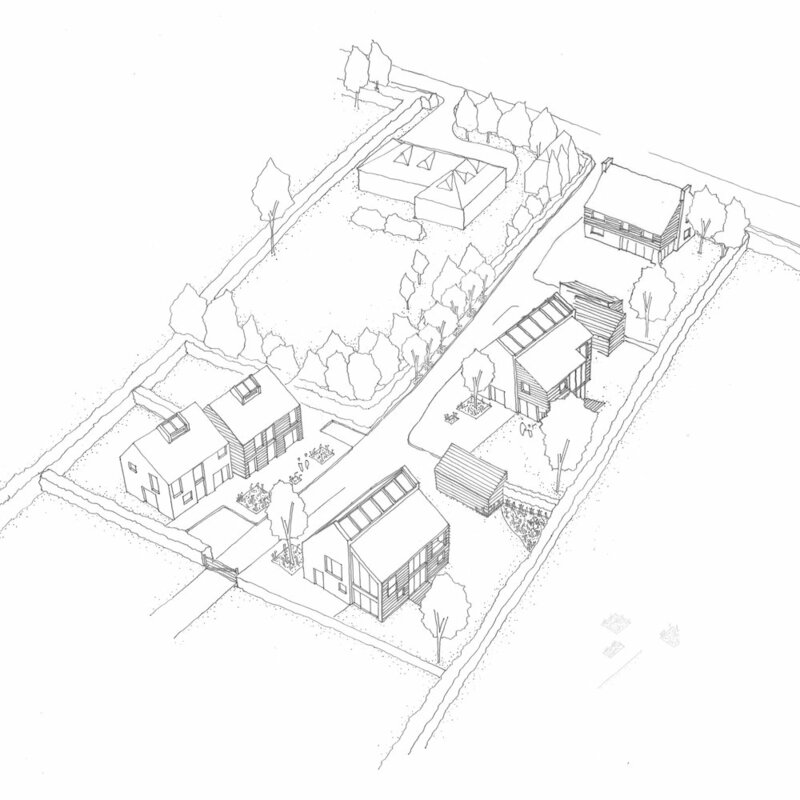 The semi-detached planning follows the same planning principles as the detached housing, this ensures the housing types are seen as part of the same family of buildings, whist achieving an excellent sustainable approach. This is also reflected in the materials and environmental zoning which informs the plans. The carefully considered approach to solar design maximises solar gain in the winter and minimises gains in the summer. This is achieved through three main strategies, glazing, orientation and thermal mass. The north side of the homes have the smallest apertures in the façade, minimising heat loss and generally contain the ‘service’ elements; such as kitchens, bathrooms, stores, – the spaces that require less windows. The glazing design allows energy form the suns rays into the heart of the building and traps the resulting heat in the sun room. The sun room acts as a buffer which controls how much of this stored heat penetrates the rest of house depending on the time of year. The sun room creates a solar gain control mechanism, whilst maximising natural light, not only creating a greater living environment for users but also reduces the need for artificial lighting and the associated energy consumption. Smaller openings and overhangs in other areas of the buildings help to reduce unwanted heat gains in the summer and heat losses in the winter. The designs are a modern interpretation of the existing village typologies, they borrow key elements of the materials within the village and echo the distinctive architectural elements of some of the houses in the village. The red brick and dark timber for example are a common occurrence in the village. The local authority were unanimous in their decision to approve the scheme highlighting it’s excellent design.